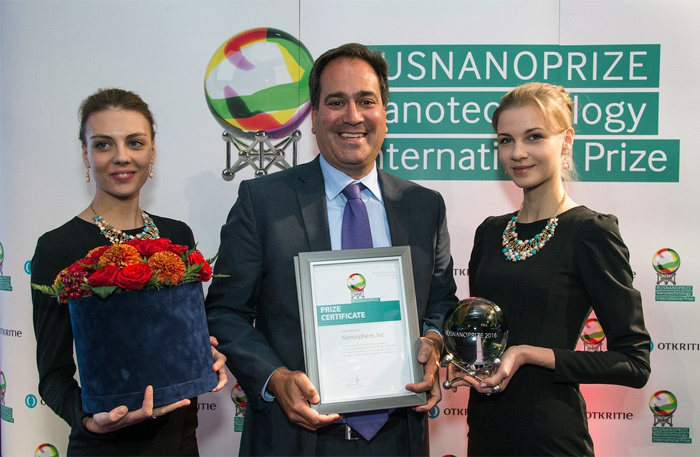 In 2016 RUSNANOPRIZE Nanotechnology International Prize was awarded to Dr. Mirkin for the development of three-dimensional nucleic acid nanostructures called Spherical Nucleic Acids (SNAs) that are enabling technological advances in biological and medical diagnostics and pharmaceutical development. Nanosphere, Inc.—awarded for being the first in achieving successful commercialization of three-dimensional nucleic acid nanostructures (Spherical Nucleic Acids, SNAs) in production of Verigene® System instrumentation and many other medical, pharmacological, and biotechnological materials and devices based on SNAs. The prize solemn award ceremony was held within the frameworks of Open Innovation Forum. Essentially, Dr. Mirkin has taught the world that organizing nucleic acids, the most important class of molecules ever studied, into highly oriented, densely packed spherical materials can dramatically change the fundamental chemical and physical properties of such structures and make them extraordinarily useful in the areas spanning biomedicine, pharmacology, and biotechnology, including clinical diagnostics and intracellular gene regulation and immunomodulation. As both the top most cited chemist and nanomedicine researcher in the world, Chad Mirkin has clearly distinguished himself academically, but the ultimate value of his work is being proven by its impact on business and society as well as life itself. Dr. Mirkin’s discoveries and inventions, particularly those involving SNAs (nanomaterials which are typically comprised of nanoparticle cores and densely functionalized and highly oriented nucleic acid shells), are rooted in basic science advances, but yet are igniting change across a number of industries from the life sciences to health care. Dr. Mirkin is the inventor on over 1,000 patent applications (288 issued) worldwide. His SNA inventions are at the core of product development at Nanosphere (recently acquired by Luminex) and form the basis of a patent portfolio ranked by 1790 Analytics as number two in the world across all industries behind that of only Hewlett Packard Company. His work and leadership have helped to build Northwestern University into one of the largest nanotechnology centers in the world. Northwestern was selected as one of the six nanoscale science and engineering centers funded by the National Science Foundation and as one of eight nanocancer centers funded by the National Cancer Institute. It should come as no surprise that funding for the Institute now exceeds $800 million, and the companies Mirkin has founded (Nanosphere, AuraSense, AuraSense Therapeutics, and NanoInk) have already garnered over $700 million in private and venture capital from some of the top firms in the industry. To quote Sir Fraser Stoddart, “A century ago if you were an artist or writer, Paris was a magnet drawing people. Today, Northwestern is the magnet drawing people in nanotechnology.” Mirkin has been the driving force to help make this happen. In 2016 RUSNANOPRIZE is sponsored by Otkritie Financial Corporation Bank. The RUSNANOPRIZE was established in 2009 by Russian Nanotechnologies Corporation, which is one of the world’s largest investment companies in the innovation industry. The prize is awarded to both Russian and foreign nationals. Four of the eight winners in the five-year history of the award have been foreign designers. public recognition of the role of the individual scientists, developers and teams that carry out scientific research.